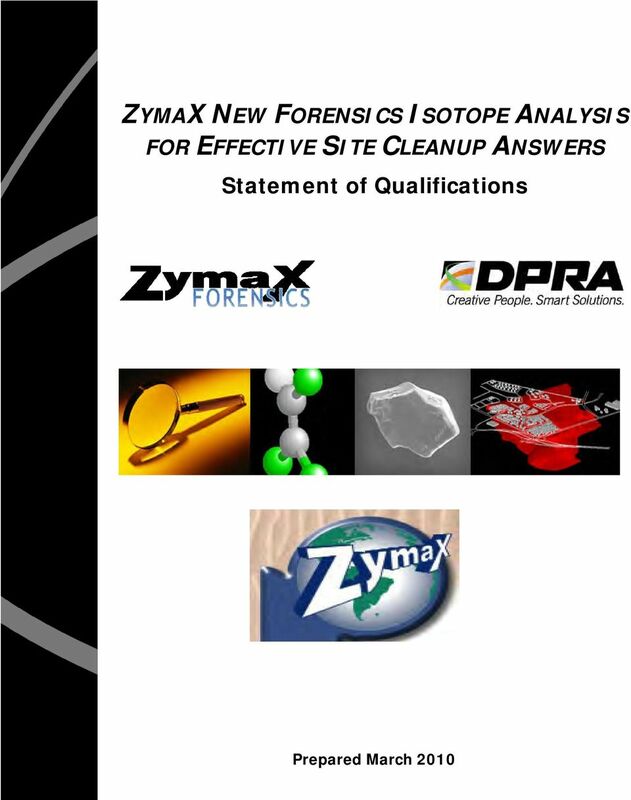 Download "ZYMAX NEW FORENSICS ISOTOPE ANALYSIS"
3 2 ZymaX New Isotope Analysis, a Powerful Tool for Site Cleanup Decisions ZymaX new Compound Specific Isotope Analysis is a reasonable low cost technique that supports critical time sensitive decisions for groundwater assessment & remediation of chlorinated solvents to determine: 1) Source Identification, 2) Co-mingled Plumes, 3) Treatment System Optimization. These unique ZymaX capabilities allow for quick study of alternative treatment remedies such: 1) Natural Attenuation, 2) Enhanced Attenuation, 3) Thermally Enhanced Extraction, and 4) Polishing Bioremediation. 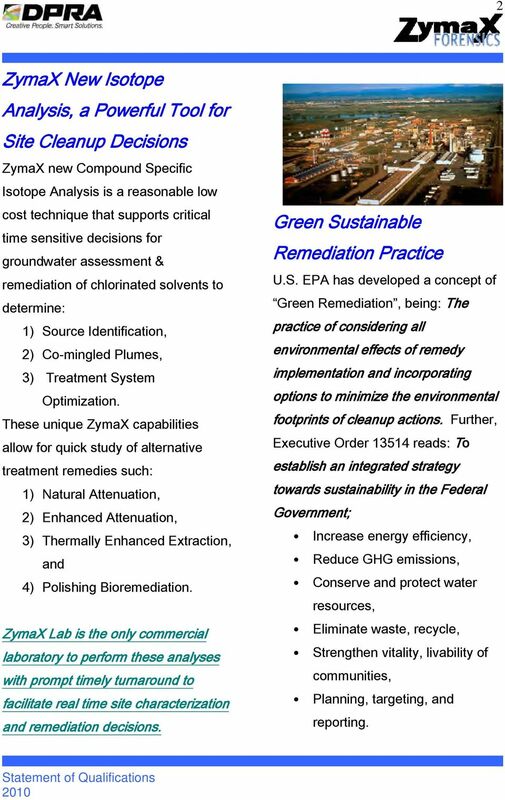 ZymaX Lab is the only commercial laboratory to perform these analyses with prompt timely turnaround to facilitate real time site characterization and remediation decisions. Green Sustainable Remediation Practice U.S. EPA has developed a concept of Green Remediation, being: The practice of considering all environmental effects of remedy implementation and incorporating options to minimize the environmental footprints of cleanup actions. Further, Executive Order reads: To establish an integrated strategy towards sustainability in the Federal Government; Increase energy efficiency, Reduce GHG emissions, Conserve and protect water resources, Eliminate waste, recycle, Strengthen vitality, livability of communities, Planning, targeting, and reporting. 4 3 Isotopic Analysis DPRA is the only commercial laboratory with the capability to perform stable isotopic analysis for carbon, chlorine, nitrogen, oxygen, hydrogen, and sulfur. Stable isotopes are different types of atoms (nuclides) of the same chemical element, each having a different number of neutrons. Different isotopes of the same element (whether stable or unstable) have nearly the same chemical characteristics and therefore behave almost identically. The mass or scale differences resulting from a variance in the number of neutrons result in partial separation of the light isotopes from the heavy isotopes during physical, chemical and biological reactions. Compound Specific Isotope Analysis (CSIA) data can be used to distinguish between same chlorinated solvents, such as PCE and TCE, from different sources. For example, CSIA can be used to determine: If PCE or TCE in one plume is from one or more sources If PCE or TCE in separate plumes is from the same source or different sources If TCE in a PCE plume is from degradation of PCE, or from a separate TCE source This process called isotope fractionation is used by ZymaX in its new analysis service. 5 4 Environmental Forensics Property owners, attorneys, lenders, regulatory agencies, and other stakeholders often disagree about the responsibility for cleaning up subsurface contamination. The primary goal of environmental forensics is to provide answers for several key contaminant-related questions commonly asked by these parties: Onsite TCE Who is responsible for the release? Onsite PCE-A Onsite PCE-B What are the contaminants? What is the source? When did the release occur? What is a reasonable cost allocation for clean up? General forensic techniques performed by ZymaX re-constructing the history of a site, identifying specific compounds present in one or more potential sources, and performing appropriate lab analysis for these compounds. 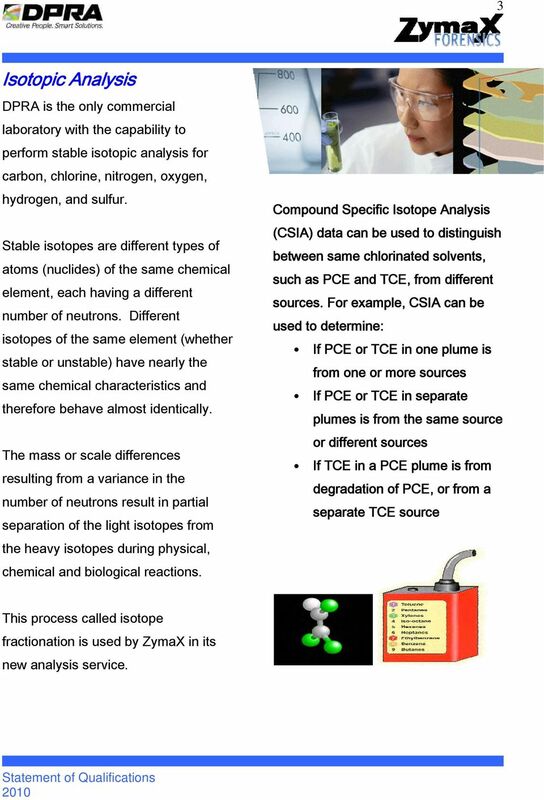 Historical information, sophisticated laboratory techniques, and scientific principles of organic chemistry are combined to allow ZymaX present the results in a manner that is both scientifically defensible and clearly understood by technical and nontechnical audiences. 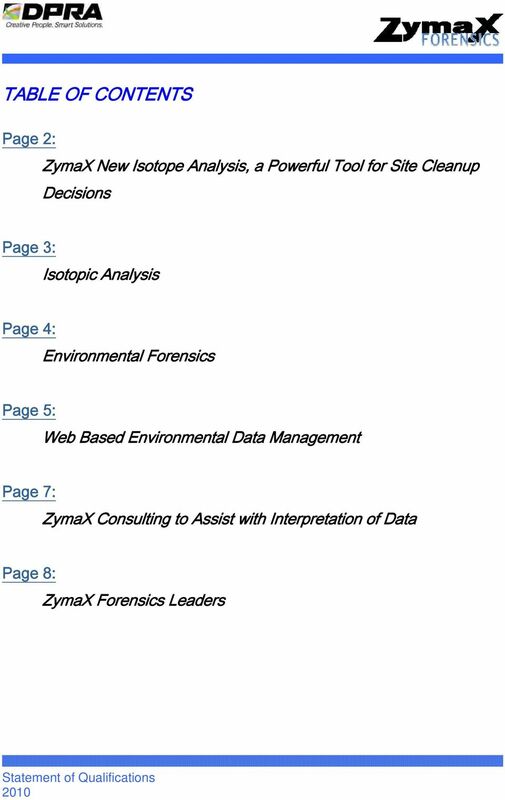 Because forensic testing may reveal that more testing is necessary to accomplish the primary goals, ZymaX uses a tiered approach to each environmental forensic investigation. The initial phase includes a preliminary evaluation to determine if the site and nature of the spill offer a reasonable opportunity for success by forensic analysis. To avoid unnecessary costs, ZymaX conducts cursory testing that may indicate whether more sophisticated analysis is needed. 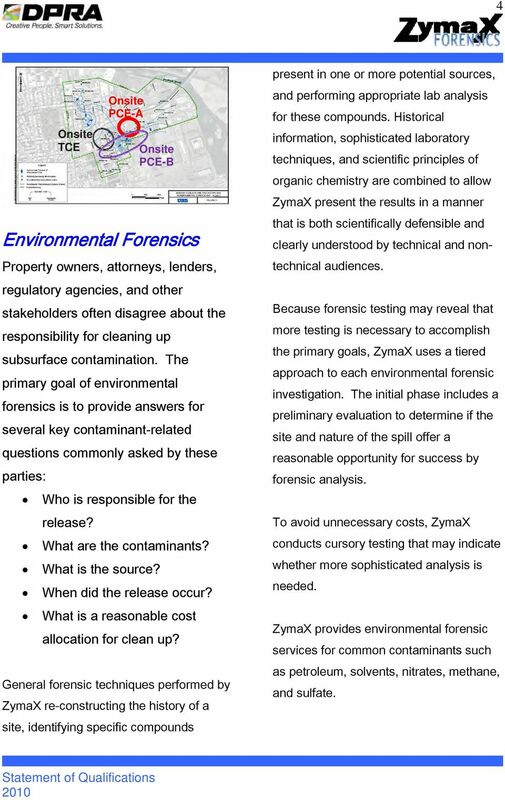 ZymaX provides environmental forensic services for common contaminants such as petroleum, solvents, nitrates, methane, and sulfate. 6 5 Web Based Environmental Data Management DPRA Inc. specializes in developing secure, integrated and powerful webbased applications that provide life-cycle management of chemical data including groundwater, surface water, ambient air, animal and plant tissue, buildings and infrastructure, and stack sampling, we provide: Map design and cartographic production; Digital and hard copy vector and raster products. 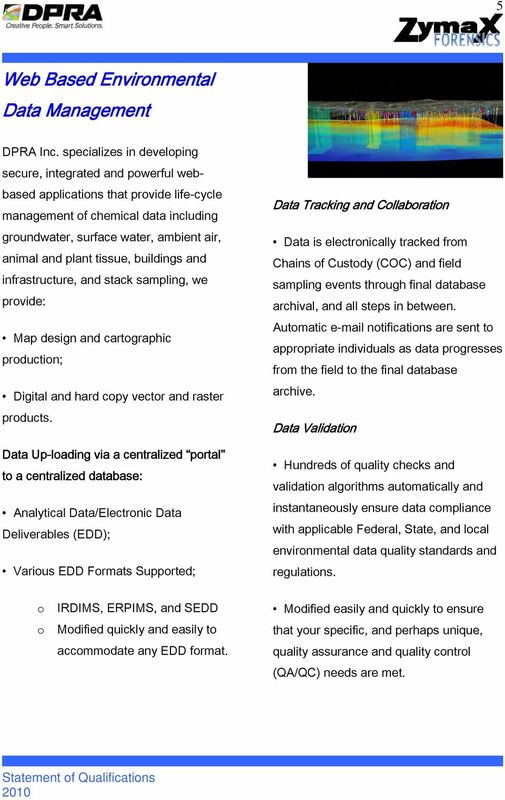 Data Up-loading via a centralized portal to a centralized database: Analytical Data/Electronic Data Deliverables (EDD); Various EDD Formats Supported; Data Tracking and Collaboration Data is electronically tracked from Chains of Custody (COC) and field sampling events through final database archival, and all steps in between. Automatic notifications are sent to appropriate individuals as data progresses from the field to the final database archive. Data Validation Hundreds of quality checks and validation algorithms automatically and instantaneously ensure data compliance with applicable Federal, State, and local environmental data quality standards and regulations. o o IRDIMS, ERPIMS, and SEDD Modified quickly and easily to accommodate any EDD format. Modified easily and quickly to ensure that your specific, and perhaps unique, quality assurance and quality control (QA/QC) needs are met. 7 6 Intelligent Data Retrieval Powerful web-based search functionality that incorporates advanced search capabilities which provide end users easy-to-use access to stored information. Retrieved results can be viewed on tables, graphs, charts, and interactive maps. Users can also generate any number of complex, formatted reports, as well as maps and output suitable for use in spreadsheets, documents, and other databases. Data retrieval modules can be modified easily and quickly to accommodate any data query, visualization, mapping, analyses or any report generation regardless of complexity. DPRA has nearly 20 years continuous contract experience performing services for the Department of Army on-site at the Rocky Mountain Arsenal (RMA) in Commerce City, Colorado. 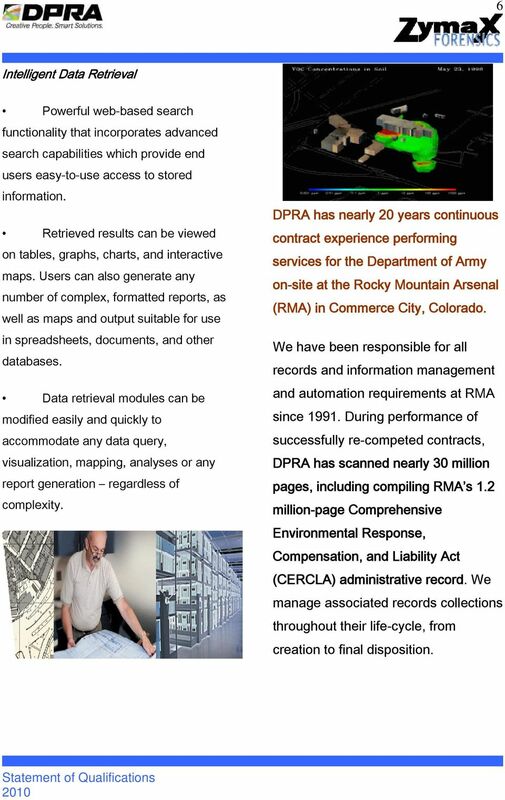 We have been responsible for all records and information management and automation requirements at RMA since During performance of successfully re-competed contracts, DPRA has scanned nearly 30 million pages, including compiling RMA s 1.2 million-page Comprehensive Environmental Response, Compensation, and Liability Act (CERCLA) administrative record. We manage associated records collections throughout their life-cycle, from creation to final disposition. 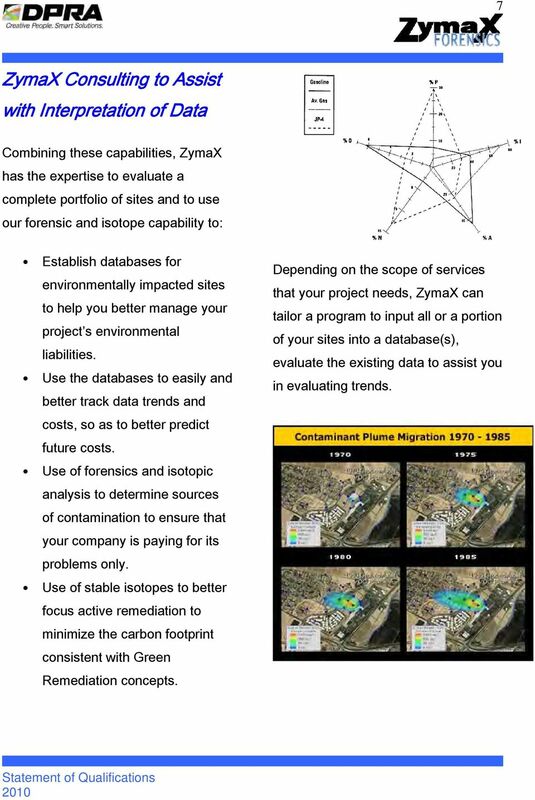 8 7 ZymaX Consulting to Assist with Interpretation of Data Combining these capabilities, ZymaX has the expertise to evaluate a complete portfolio of sites and to use our forensic and isotope capability to: Establish databases for environmentally impacted sites to help you better manage your project s environmental liabilities. Use the databases to easily and better track data trends and costs, so as to better predict future costs. Use of forensics and isotopic analysis to determine sources of contamination to ensure that your company is paying for its problems only. Use of stable isotopes to better focus active remediation to minimize the carbon footprint consistent with Green Remediation concepts. Depending on the scope of services that your project needs, ZymaX can tailor a program to input all or a portion of your sites into a database(s), evaluate the existing data to assist you in evaluating trends. 9 8 ZymaX Forensics Leaders Shan-Tan Lu, Ph.D. Dr. Lu has a B.S., M.S. and Ph.D. in geochemistry and is Director of Petroleum Forensics. He has twenty-six years experience as a petroleum geologist and geochemist including extensive research and development of analytical methodologies for petroleum exploration and production; development of powerful environmental forensic analytical methods based on traditional methods from petroleum geochemistry; and interpretation of geochemical data and client consulting. 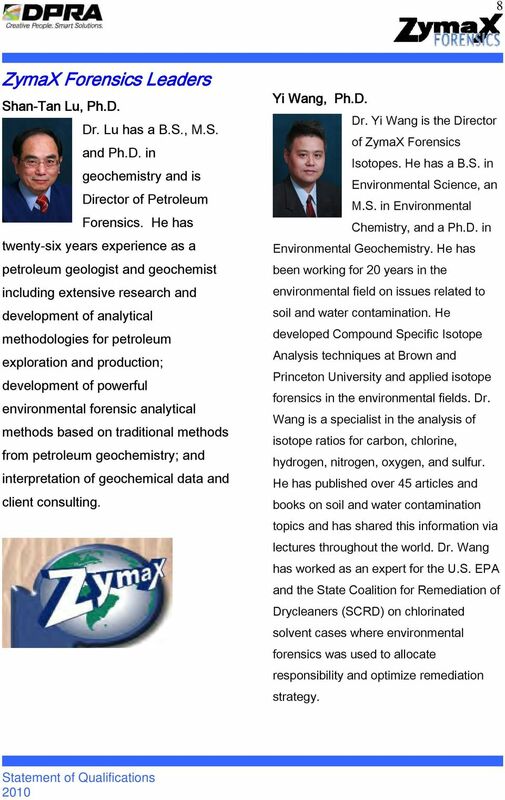 Yi Wang, Ph.D. Dr. Yi Wang is the Director of ZymaX Forensics Isotopes. He has a B.S. in Environmental Science, an M.S. in Environmental Chemistry, and a Ph.D. in Environmental Geochemistry. He has been working for 20 years in the environmental field on issues related to soil and water contamination. He developed Compound Specific Isotope Analysis techniques at Brown and Princeton University and applied isotope forensics in the environmental fields. Dr. Wang is a specialist in the analysis of isotope ratios for carbon, chlorine, hydrogen, nitrogen, oxygen, and sulfur. He has published over 45 articles and books on soil and water contamination topics and has shared this information via lectures throughout the world. Dr. Wang has worked as an expert for the U.S. EPA and the State Coalition for Remediation of Drycleaners (SCRD) on chlorinated solvent cases where environmental forensics was used to allocate responsibility and optimize remediation strategy. 10 9 Alan Jeffrey, Ph.D. Dr. Jeffrey has a BS in biochemistry, an MS in organic chemistry and a PhD in oceanography. Dr. Jeffrey has over 20 years of US and international experience in environmental science and geochemistry. His expertise includes managing research projects, managing geochemical and environmental analytical laboratories; initiation and management of countrywide water monitoring program; QA/QC management of analytical laboratories; and setting up and managing a small environmental consulting company. 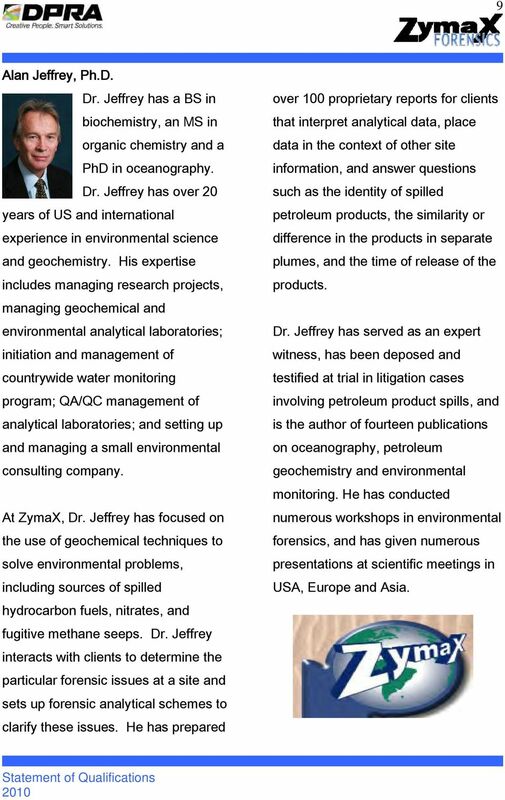 At ZymaX, Dr. Jeffrey has focused on the use of geochemical techniques to solve environmental problems, including sources of spilled hydrocarbon fuels, nitrates, and fugitive methane seeps. Dr. Jeffrey interacts with clients to determine the particular forensic issues at a site and sets up forensic analytical schemes to clarify these issues. He has prepared over 100 proprietary reports for clients that interpret analytical data, place data in the context of other site information, and answer questions such as the identity of spilled petroleum products, the similarity or difference in the products in separate plumes, and the time of release of the products. Dr. Jeffrey has served as an expert witness, has been deposed and testified at trial in litigation cases involving petroleum product spills, and is the author of fourteen publications on oceanography, petroleum geochemistry and environmental monitoring. He has conducted numerous workshops in environmental forensics, and has given numerous presentations at scientific meetings in USA, Europe and Asia. 11 10 Gregory Smith, P.E., P.G. Mr. Smith brings over 28 years professional experience in project, program and line management, environmental forensics, and remediation of contingent environmental liabilities affecting industry. At DPRA, he leads the practice in hydrogeology and site remediation as it relates to work for attorneys and their corporate clients. 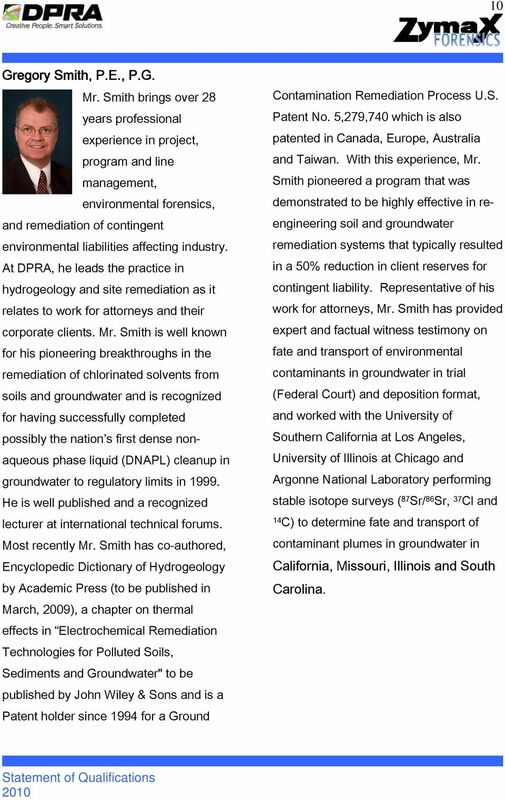 Mr. Smith is well known for his pioneering breakthroughs in the remediation of chlorinated solvents from soils and groundwater and is recognized for having successfully completed possibly the nation s first dense nonaqueous phase liquid (DNAPL) cleanup in groundwater to regulatory limits in He is well published and a recognized lecturer at international technical forums. Most recently Mr. Smith has co-authored, Encyclopedic Dictionary of Hydrogeology by Academic Press (to be published in March, 2009), a chapter on thermal effects in Electrochemical Remediation Technologies for Polluted Soils, Sediments and Groundwater" to be published by John Wiley & Sons and is a Patent holder since 1994 for a Ground Contamination Remediation Process U.S. Patent No. 5,279,740 which is also patented in Canada, Europe, Australia and Taiwan. With this experience, Mr. Smith pioneered a program that was demonstrated to be highly effective in re- in a 50% reduction in client reserves for engineering soil and groundwater remediation systems that typically resulted contingent liability. Representative of his work for attorneys, Mr. Smith has provided expert and factual witness testimony on fate and transport of environmental contaminants in groundwater in trial (Federal Court) and deposition format, and worked with the University of Southern California at Los Angeles, University of Illinois at Chicago and Argonne National Laboratory performing stable isotope surveys ( 87 Sr/ 86 Sr, 37 Cl and 14 C) to determine fate and transport of contaminant plumes in groundwater in California, Missouri, Illinois and South Carolina. National Aeronautics and Space Administration Space flight and exploration begin with developing innovative technologies here on Earth. Our commitment to environmental stewardship is central to that effort. SEDIMENTARY GEOLOGY STABLE ISOTOPES. SEPM Short Course No. 10. Dallas 1983. MICHAEL A. ARTHUR, Organizer THOMAS F. ANDERSON JAN VEIZER LYNTON S.
CHEMISTRY What can I do with this degree? Site contamination. Selecting a site contamination consultant. Introduction. What is a site contamination consultant?